Check the calendar for a variety of upcoming meetings, bottle shares, events, and more. 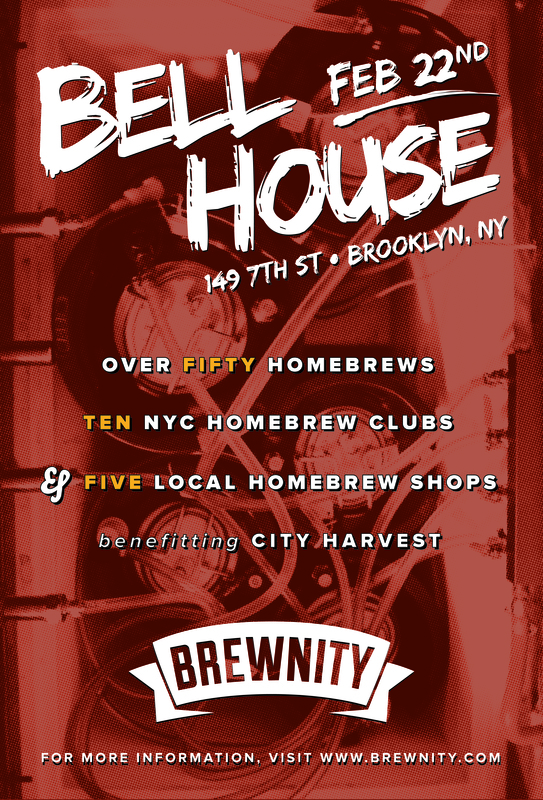 We aim to make the calendar a comprehensive list of meeting and events organized by and for the greater NYC homebrewing community. If your club, shop, or organization is hosting an event you’d like to add, ask your Brewnity representative to add it to the calendar, or contact us to ask how you can help maintain the calendar. All event proceeds will be donated to the Mayor’s Fund to Advance New York City to aid those affected by the East Village explosion. Tickets on sale now at: sudsinsolidarity.brownpapertickets.com. 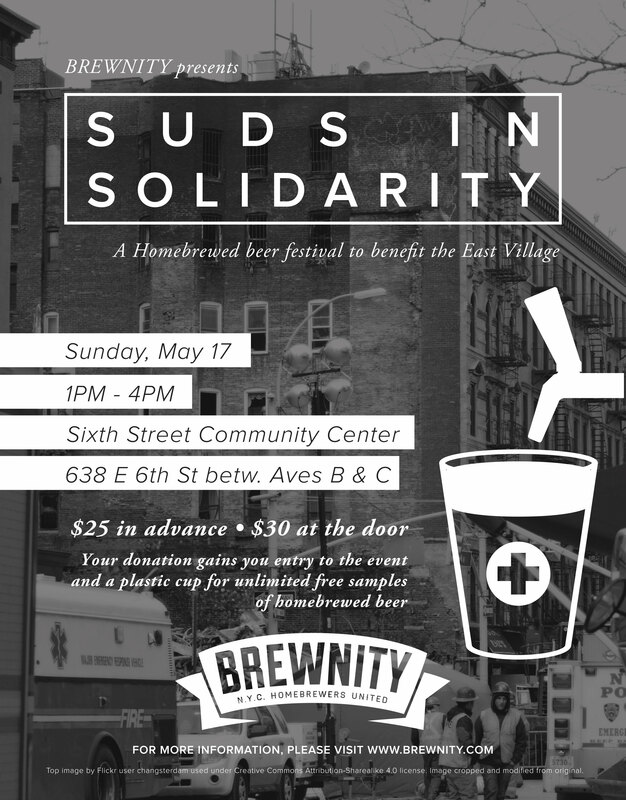 Your donation grants you entry to the event and a plastic cup for free homebrew samples. Event is indoors, rain or shine, and will expand outdoors if weather permits. Brewers donating 5 or more gallons of beer may request complimentary admission. Brewers must sign up in advance. Complimentary admission will be limited to a maximum of 18-20 brewers. Interested brewers should sign up no later than 10am, April 23. Complimentary tickets will be distributed evenly between clubs and stores, which will be notified of their allowance by April 25. Volunteers are needed to help with light work in half hour shifts on the day of the event. Volunteering guarantees the warm and fuzzy feeling of being a good person helping a worthy cause. Volunteers will also receive a complimentary Brewnity branded glass. One-hour and longer shifts are available for those seeking additional self-satisfaction. Interested volunteers should obtain a ticket and email Shannon Bowser (shannon@bowser.org) and Jon Luton (jezcoe@gmail.com) for details and to schedule a time. Jimmy’s No. 43, Burp Castle, and Standings have long been a hub of NYC homebrewing and were closed for two weeks following the explosion. We hope to collect donations from homebrewers to buy gift certificates to those bars and to then include those certificates in the Suds in Solidary raffle. Money raised for the purchase of the gift certificates will support the bars, and all raffle ticket proceeds will be donated to the Mayor’s Fund to Advance New York City; East Village Building Collapse fund. If you’d like to contribute toward the purchase of these gift certificates, please contact Alex Kalaf (alex.kalaf@gmail.com). And as the Bell House is a fantastic live performance venue, the event intends to feature a makeshift band comprised of musican homebrewers to play a set or few of classic and original tunes. Tickets provide entry to the 4 hour event and a plastic cup for samples. Starting at $25, the varying prices reflect how much is donated to City Harvest on your behalf. Brewnity is NYC Homebrewers United. 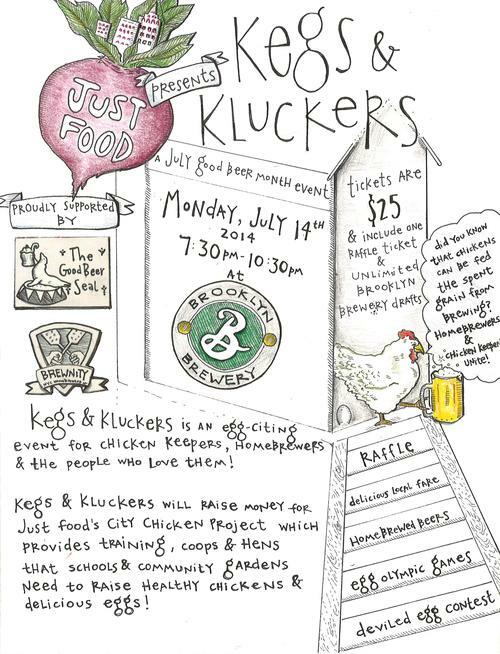 A loosely organized (no officers) all inclusive collective of NYC Homebrewers (those with and without clubs), together to do right by the community by sharing beer, demystifying homebrewing to beer fans, and continuing education for those already brewing. Not for profit. Public paid events to benefit charities.